Aged for 16 months in 95% French, medium toast; 5% Hungarian, 50% new, 50% one year old. The 2010 vintage has been much talked about because of its substantially cooler than average cumulation of heat units. I feel Merlot, which reaches flavor maturity a bit quicker than the other Bordeaux varieties, really shines in cooler years. We looked forward to the challenge of a vintage that was much more like the vintages of the early ‘90s, when we first started working with the great fruit of Washington State, and 2010 delivered. We also welcomed the achievement of flavor maturity at lower sugar levels. This is the first of at least two vintages in a row that will show amazing structure with lower than the normal alcohol levels. We worked very hard with the outstanding vineyard crew at Sagemoor’s Bacchus and Dionysus, to manage the crop very carefully by opening the canopies and dropping clusters that were not exposed to the sun, or weren’t at the same maturity level. In the winery, we had the luxury to extend the maceration after dryness, which softened the tannins giving this wine a beautiful, fine, silky texture. We then aged it in barrel a bit longer than is usual for our Merlot, but it really benefited from the added time to mature. This one-hundred-percent Merlot has really nice, bright red fruit, rose petals, and a richness on the nose. Flavors of plum, mountain strawberry and mocha come together with a balanced mouth feel and a long finish. Though it was a cooler vintage, I feel we have still captured the powerfully elegant style for which we are known. "This is toasty, dense and inviting from the first sniff to the last swallow. It’s an authoritative, tightly woven and complex wine that offers a core of plum and cassis flavors, annotated by streaks of coffee, licorice and iron. The tannins are textural and gripping. Delicious now, this can also be cellared for a decade. — P.G." The Abeja Winery sits at the base of the Washington Blue Mountains, just east of Walla Walla, on a farm estate over 100 years old. Ken and Ginger Harrison spent 35 years in Portand, Oregon before their strategic move to Walla Walla. The growing climate was ideal for Cabernet Sauvignon, Ken’s preferred varietal, which made this the perfect location for Abeja Winery. Ken focused on growing and producing, while Ginger operated the Harrison’s Inn. In 2002, Ken and Ginger met the perfect additions to their Abeja Winery team, John Abbott and Molly Galt. Hailing from the Napa Valley since college, John worked at Pine Ridge and Acacia Winery. He and Molly later began Canoe Ridge Vineyard in Walla Walla. Molly handled all of the marketing and public relations and John was the winemaker for almost ten years. When choosing a name for their vineyard, they wanted to represent a period of farming that had respect for the environment and close connection to the earth. The word “Abeja” is Spanish for bee. The simplistic nature and beauty of the word complimented their “farm softly” style. The honeybee is the ultimate symbol for their way of life because honeybees are so impacted by how one farms and yet very important to an ample and robust style of agriculture. The Abeja Winery truly strives to make a difference by minimizing impact and nurturing the land. 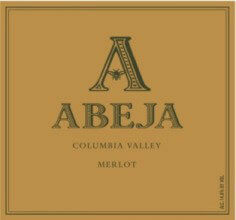 Abeja vineyards are certified sustainable farming by organizations such as LIVE, Salmon Safe, and Vinea. Any Abeja wines we have in stock are listed below, if you don’t see the wine you are looking for please don’t hesitate to ask for it.